We are currently in the middle of a global crisis. Diabetes, heart disease, obesity and mood disorders are all on the rise. What if I was to tell you that they all have one familiar thing in common? What if I could show you simple ways to improve your health by sifting through the lies and misconceptions? The following is just a piece to this puzzle we call health care; but a very important one. I’m not sure if there is a nutritional topic with greater misinformation than sugar consumption and sources. To begin we need a brief overview of sugar. Sugar is a carbohydrate made up of carbon, hydrogen and oxygen. These molecules make combinations of simple and complex carbohydrates. Simple sugars are glucose (dextrose), fructose, and galactose. Disaccharides are considered complex sugars and are combinations of the simple sugars i.e. Sucrose or table sugar is made up of glucose and fructose. Unfortunately, it’s not quite as simple as that when we look at how the body processes things. Items like most commercial breads, pastas, cereals, candy, yogurts, and several other items, sometimes even ones touted as healthy, have loads of sugars that will be released when they’re broken down. As a general rule we want to lean toward complex carbs filled with fiber! Things like vegetables and certain fruits, like berries. Check out the graphic below. 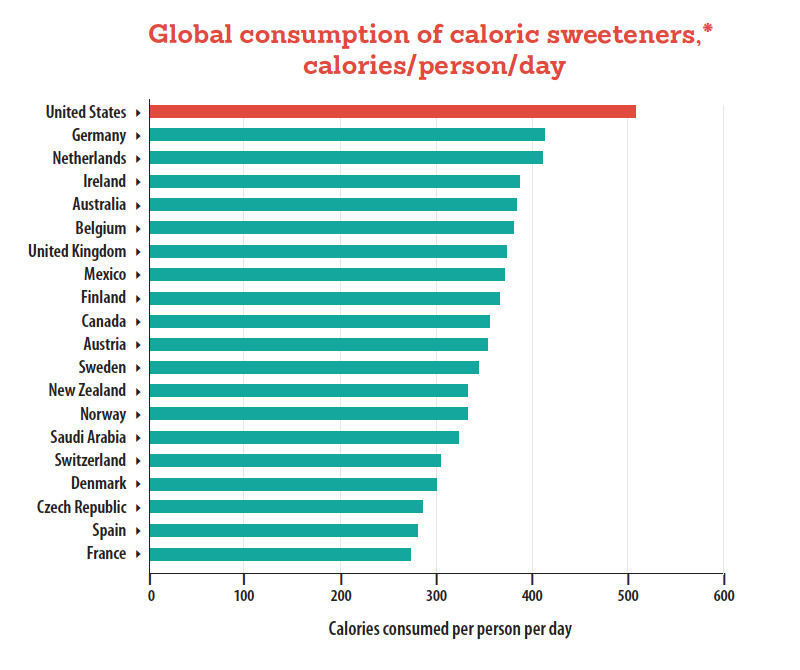 As you can see there is a staggering amount of sugar consumed throughout the entire world, but the USA takes the cake (pun intended). Let’s keep it simple….sugar in excess causes inflammation and we’re not just talking “stub your toe” inflammation. Rather, that which happens at a cellular level and can disrupt the very fabric of our physiology. Inflammation has proven to be at the root of nearly every illness. The Dangers of sugar Excessive sugar in the blood stream causes the pancreas to work harder in its production of insulin. Insulin is the hormone that helps get glucose into the cells for energy production. There are two problems with our current diets: We have too much sugar which causes the pancreas to become “exhausted” and insulin production diminishes; while at the same time the cells that were bombarded with excessive sugars and insulin retract their receptors (or translocate) so insulin’s action is no longer as powerful. This creates the perfect storm for disease. 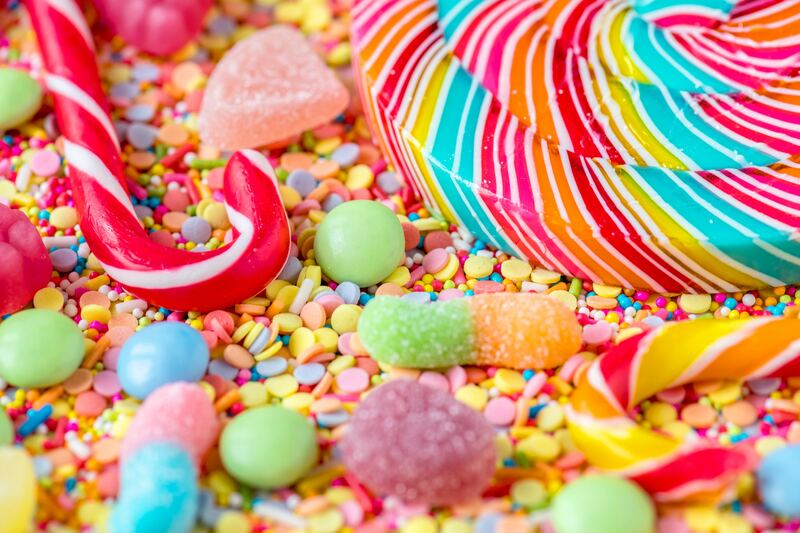 We’re not only talking about diabetes here, but cardiovascular disease, autoimmunity and behavioral disorders such as ADHD/ADD have all been linked back to the abnormal intake of sugar. A study published in the, Journal of Pediatrics, looked at almost 3,000 5 year-olds who drank 1-4 servings of soda per day. The result was those who consumed the soda had a significant higher level of aggressiveness compared to those who did not. They further described that it was a dose-dependent response, which means the more soda consumed, the more exaggerated the poor behavior. The biggest draw to consume artificial sweeteners is that they are low in calories and do not act like sugar in regard to triggering an insulin response. Well, this isn’t entirely true. Most people forget that digestion starts in the brain. As soon as your nostrils sense a sweet substance or your tongue the digestive process begins which also includes the release of insulin to prepare for a sugary meal. The bottom line here is that while many artificial sweeteners may not raise blood sugar, they can have an effect on insulin levels, which will inevitably lead to insulin resistance. Further research shows us that those who consume artificial sweeteners can actually become addicted because they can be up to 1000x sweeter to our brain than regular table sugar. In fact, an article published in Environmental Health stated that women who drank diet soda drank twice as much when compared to those who drank sugar-sweetened soda. So why does Sugar Make me fat? Shouldn’t Fat make me fat? When we think of food we need to consider that the body treats it as a source of energy. Carbs/Sugar, Fat, and Protein all get broken down into different molecules to drive our metabolic functions. The body is kind of lazy though. It wants to follow the path of least resistance and usually, if given the option, will break down Carbs/sugar before anything else. Looking at this from an energy perspective, if you don’t need the energy you provide to your body, what happens? YOU STORE IT!! The standard American diet is riddled with high Carb/Sugary food, and our society is becoming progressively more sedentary, especially in the work place. So what does this look like? When we eat that burger and fries and go sit at our desk, or eat that plate of pasta and then go sit on the couch to watch our favorite sitcoms, our body does what it was designed to do. It breaks down the Carbs to use as energy and then realizes it’s not going to use it so it stores it for when it really needs it as FAT. What do I recommend? The obvious answer is to avoid all of the above as much as possible. We also need to increase our daily intake of pure water, there is no magic calculation for the amount but a general estimate is about half your body weight in fluid ounces per day. Your vegetable to fruit consumption should be somewhere in the neighborhood of a 3:1 ratio and also include a wide varied of colors and types. Last but not least, stay active. Pushing the energy pathways by exercising will require your body to utilize sugar more readily for energy thus less circulating in the blood. Above all we need to start burning fat as a fuel source instead of relying on sugars. Burning fat for energy is key to getting rid of the fat on our frame. That is exactly what the Activate Metabolics program we use in our clinic is designed to do! Jump start the metabolism and activate the fat burning. Then, couple that with DNA TESTING in order to provide you an individualized eating approach for a focused lifestyle change. Ready to get OFF the sugar and ON to a lifestyle of healthy eating and sensible weight control? Just click, call or come in sometime soon. We can help! This blog piece was contributed by Activate Metabolics providers Dr. Shaun Adams and Dr. Brett Wisniewski. They are both Doctors of Chiropractic at Gateway Natural Medicine located in Berthoud, Colorado. www.gatewaynaturalweightloss.com.